Long after the crowd has filed out of M&T Bank Stadium after a Ravens home game, safety Eric Weddle returns to the field. The seats are all empty, but his biggest fans are there. 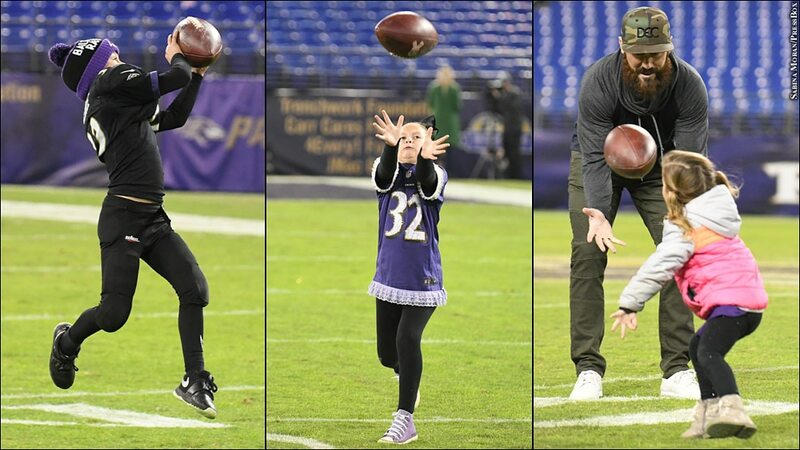 Dressed in street clothes and a baseball hat, Weddle tosses a football to his son, Gaige, while his wife, Chanel, helps one of their three daughters do back handsprings in the stadium grass. About an hour or so after virtually every Ravens home game, this is the Weddles' playground, their family room, the place where Weddle's roles as NFL star, husband and father converge most clearly. Weddle, now in his 11th NFL season and second in Baltimore, takes each of those roles seriously, and it's not an easy balancing act. An admitted workaholic, Weddle heads to the Ravens' facility in Owings Mills, Md., before dawn many mornings, but he takes his 3-year-old daughter Kamri to preschool on his off days. Road games mean a lot of time away from home, but Monday is reserved for date night for him and Chanel, high school sweethearts who have been married for 12 years. Spend any time with Weddle, and the word "family" frequently pops up -- referring to his own brood or the atmosphere that he says pervades the Ravens' organization. That's one reason the West Coast transplant has loved his time in Baltimore. Simply put, family matters. As the Weddle family prepares for a holiday photo shoot in their Pikesville, Md., home, pig-tailed Kamri takes a small tumble down the steps and ends up in tears, and 9-year-old Brooklyn rushes over to comfort her. The other children, 8-year-old Gaige and 6-year-old Silver, bound down the stairs, then back up, then back down again. Chanel, her shoulder-length hair colored with a tinge of red, surveys the scene with the calm that comes from being a mother of four. In the vernacular of her husband's profession, she is a nearly 10-year veteran of this parenting game. She's got this. "She keeps us together," Weddle said. "She's the rock of our family. I'm lucky to have her." Eric Weddle isn't really supposed to be here. Not in Baltimore, not married to Chanel, not a father of four, not on this earth. When Weddle's mother, Debbie, was in her second trimester of pregnancy in 1984, she woke up one night with the sheets soaked with amniotic fluid. She feared she had lost her baby. After rushing to the hospital, she was told by doctors that she was likely to have a miscarriage or quickly go into premature labor. Neither happened -- not that night, not in the days that followed as she was closely monitored at the hospital. The baby's heartbeat remained strong, and Debbie's uterus recovered as well, mystifying doctors. Four months later, Eric Weddle was born. So he comes by his competitive fire naturally. He was literally born with it. Weddle was a high school sports star at Alta Loma High School in Southern California, playing football, basketball and baseball -- which might have been his calling if not for a high fastball that caught Weddle near his left eye and effectively ended his baseball career. As a 5-foot-11, 185-pound football player, scholarship offers from the Pac-10 schools -- and just about every other Division I football program -- never materialized, even though Weddle was a two-time league MVP. Utah at that time had an up-and-coming coach named Urban Meyer, and he wasn't all that impressed, either. "'Are you sure about this guy? Is this guy for real?'" Kyle Whittingham, then an assistant to Meyer and now the Utes head coach, recalls Meyer asking him. "Cause he looked like 10,000 other high school players. I mean, there was nothing really special about him, just looking at him." But Whittingham saw something right away when he recruited Weddle. "When you watched the tape, and when you watched him, he was a four-sport guy," Whittingham said. "There was nothing he couldn't do. I said, 'Trust me, Coach,' this guy is special.'" Weddle signed with Utah and was a starter by the third game of his freshman year. He ended up a two-time Mountain West Defensive Player of the Year and was drafted in the second round in 2007 by the San Diego Chargers. Whittingham recalls one Utah spring game when Weddle, by now a star with the Chargers, returned as an honorary captain. Just for fun, Weddle was asked to kick an extra point in the game -- but it was blocked, and the other team tried to return it for a score. "He's out there in his cutoff jean shorts and tennis shoes," Whittingham said, "and he proceeds to chase this guy down, running full speed down the field for about 80 yards. He finally catches him and I'm thinking, 'Oh man, I hope the Chargers never see this clip.' ... It was just a harmless point-after-touchdown kick, and he turns it into a full-out, competitive play." Chanel Weddle notes that competition in the family runs deep. She is an athlete in her own right, a former soccer player at Utah State. "If we drive somewhere in separate cars," she said, "we try to race home." Football has been in Chanel's life as long as Weddle has. She'll occasionally stay up after the kids are asleep and rewatch Eric's game with him on a Sunday night, critiquing his play. "We don't do that as much anymore," she said, glancing over at him. "I think he's getting kind of sensitive in his old age. "I don't know coverages and all that, but I can tell when he's playing good and when he's not." At this point, nothing about the long hours, the travel, the grueling physical toll that her husband's occupation exacts comes as a surprise. But that doesn't make it any easier trying to maintain a house and keep tabs on the homework, extracurricular activities, dinner and more for four active children under age 10. "He's just gone a lot," Chanel said. "And when he comes home he's mentally and physically tired, so it's draining for him and then it's hard on me. "When he's home he's very hands on. It's just the times he misses with the kids. That's probably the hardest part." Weddle acknowledged the tug-of-war that arises from a fierce commitment to football and to family, but he sees the conflict as a short-term issue. "This may be selfish," Weddle said, stroking his trademark bushy beard, "but this is what it takes for me to be the best, and luckily she understands that, and appreciates it. ... I love the game, and I know what a difference it makes if I put extra work in. "So I do miss out on a lot, but ... this is just a short time where I'm doing this, and I'll be able to make up a lot of that down the road." Said Chanel: "If we can just get through this little bit of time, then he'll be there for everything." But, she added with a smile, "I think he likes missing homework time." By his second season with the Chargers, Weddle was a starter, leading the team in tackles with 127. By his fifth season, he was headed to the Pro Bowl and a fan favorite in Southern California. Weddle played nine seasons with the Chargers and made three Pro Bowl appearances, but his tenure with the team ended in acrimony. After the Chargers did not show interest in signing Weddle to a contract extension, he skipped voluntary offseason workouts in 2015. The tension boiled over in late December that year in what proved to be his final home game with the Chargers; Weddle stayed on the field at halftime to watch his daughter perform as part of a halftime show, and the team fined him $10,000. The team then placed him on injured reserve for the final week of the season. Given how that season ended, Weddle welcomed free agency, and the Ravens -- who had recorded a franchise-record-low six interceptions in 2015 and had failed via the draft or free agency to adequately replace Ed Reed at the back end of their defense -- jumped at the chance to sign a safety who had been named a first- or second-team All-Pro for five straight years. The Ravens signed him to a four-year, $26 million deal with $13 million guaranteed. Weddle, eager to take part in voluntary OTA workouts with his new team, commuted cross-country every week that spring while his young children finished the school year in California. "Monday to Thursday in Baltimore, home for the weekend," he said. "Do it all over again for 10 weeks. That was hard. ... It was a long stretch." 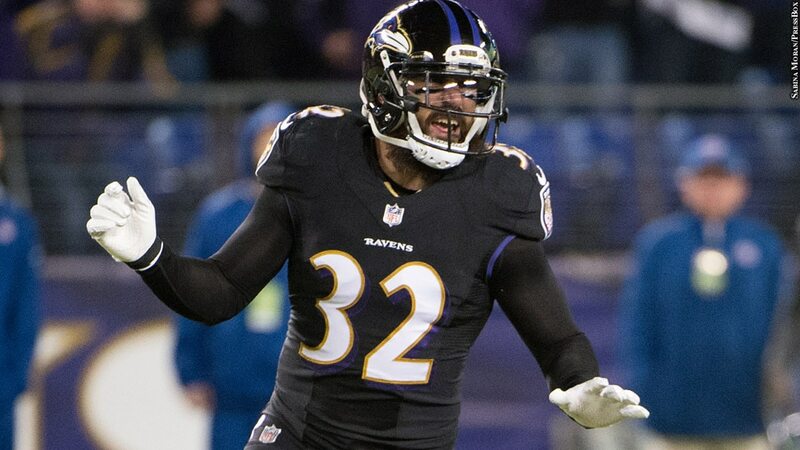 In his first season with the Ravens, Weddle finished with 89 tackles and led the team with four interceptions, earning his fourth Pro Bowl selection, and he has been an anchor again this year on a defense that has led the league in interceptions all season. He recorded the fourth interception return touchdown of his career during a win against the Detroit Lions Dec. 3. Weddle has also been a mentor to younger players such as cornerback Marlon Humphrey, who credits Weddle with helping him adjust to NFL life as a rookie, and Weddle helped recruit running back Danny Woodhead to the Ravens as a free agent. "He's a great dude, I mean aside from football," said Woodhead, who played three seasons with Weddle in San Diego. "I'm going to remember a lot of great players, but the people I'm really going to remember are the guys that are great people, too, and do things the right way. He's a prime example of that." As in San Diego, Weddle quickly became something of a fan favorite in Baltimore, an engaging, approachable star whose beard makes him one of the team's more recognizable players. It's not uncommon for Eric to be approached for autographs when he and Chanel are out on one of their date nights. "I don't mind it a bit," he said. Blue-collar Baltimore can also appreciate the everyman qualities of Weddle, who sends his kids to public school, who sees a direct correlation between sweat equity and performance, who is deeply guided by his faith. The Weddles are Mormons -- he converted in his 20s -- and this month the family performs acts of service in the 25 days leading up to Christmas. That has included donating toys to their church nursery, paying a stranger's restaurant tab and passing candy canes around their neighborhood. Weddle also shares with fans via Twitter his unapologetic passion for ice cream. After wins, Weddle will tweet out a photo of his latest victory snack to his more than 85,000 followers. "Strawberry ice cream, freshly cut strawberries, crunched up nilla wafers and sprinkles," he tweeted out after a Monday night win against the Houston Texans. "Nothing better than this." Weddle, who turns 33 in January, knows the end of his career is on the horizon. He is under contract with the Ravens for two more seasons, and that timeline is not entirely up to him. "My last two years aren't guaranteed, so they could ... release me," Weddle said. "And if that's the case I'll just retire. I don't want to move my kids and start over again. "When I signed here two years ago I said this would be the last spot for me. I've loved every second of it. ... So we'll see. I'm just living it up, loving every day, trying to help my team win and make the most of it, because you never know." Eleven NFL seasons have done a number on Weddle's body, although he has missed just three games over the past eight seasons, playing through a host of injuries. "It's a lot," Weddle said of the physical toll the sport has taken. "Neck, shoulders, not being able to sleep, walking up and down stairs sideways cause your knees hurt so bad, or your hips, or your lower back. ... It's hard." Then there is the specter of chronic traumatic encephalopathy (CTE), the degenerative brain disease that has become a hot button in the NFL, with many past players having been found to have suffered from it. A 2015 movie on the subject, "Concussion," was "hard to watch," Chanel said. Still, she added, "You can't live in fear, you know? I'm not a worrywart, so I don't really worry about it. ... He's doing what he loves. The thing about Eric is you can't ever tell him what to do. So if I was like, 'You need to stop [playing] because you're not going to be able to walk,' he would for sure keep going." Said Weddle: "I look at myself as intellectual. I think, I speak well, I like to read, I try to challenge myself. So if I continue to do those things, why would anything change?" Whenever his career ends, Weddle said, "The house will be ready and waiting for us." "The house" was built over the past couple of years high on a hill in Poway, California, northeast of San Diego. There is a million-dollar view, a pool, a basketball court, a trampoline, and, given that Weddle is a movie buff, a "secret movie theater," with the screen revealed when a bookcase slides away. "It's like you dreamed what you'd want your house to be, and then you have it. It's kind of surreal," he said. He said it's no accident that the house has no stairs -- he already knows his post-football body will have no interest in dealing with staircases every day. Chanel said the house was designed with family in mind. "We want our house to be the house where everyone comes, and their friends hang out," she said. "I have great visions for his retirement," Chanel said with a smile, draping an arm over her husband's leg before throwing her head back and closing her eyes. "I'm just going to be laying there. He's going to be on kid duty, school duty, homework duty." Weddle said he isn't thinking too far in the future about post-career work but did say it would be "cool" to coach Gaige's high school football team. Other than that, "I'll just be able to sit back, not be in pain, and not have to worry about this and that," he said. "Just enjoy the kids, enjoy Chanel, enjoy being a dad, being able to be there for everything."